The respiration from the bees, along with the humidity of my naturally damp local climate, usually provides enough moisture for the sugar to harden within days of it being poured over the top bars. 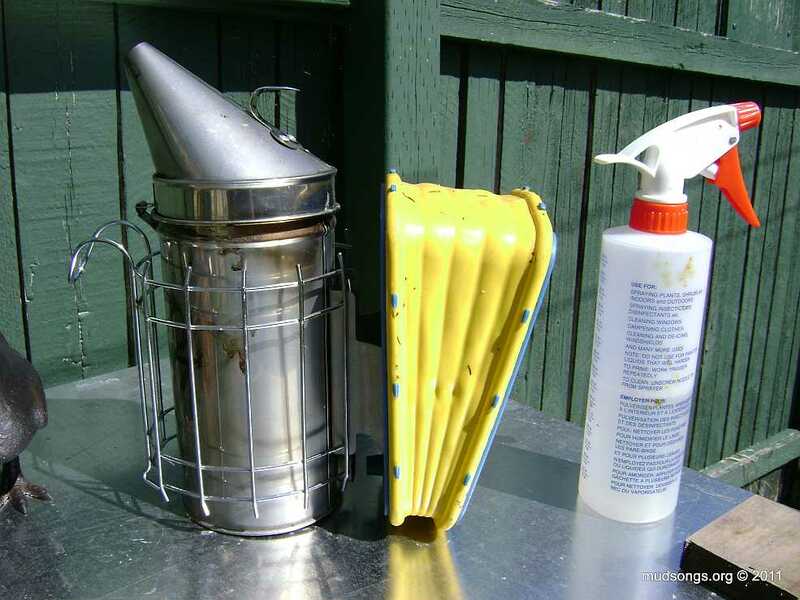 But because not everyone keeps their bees at my place (i.e., in a humid climate), it’s sometimes necessary to MIST THE SUGAR DOWN WITH WATER to make sure it hardens. Michael Bush talks about this in a video presentation from 2015. The sugar, once it has hardened, isn’t easily removed by the bees, so they just leave it there and eventually eat it when they need it, just like they would with fondant or any other kind of immovable feast. Adding some anise or another aromatic extract to attract the bees so they know the sugar is there probably isn’t a bad idea either. Spray bottle on the right for misting down dry sugar. (June 1, 2011). So not everything works for everyone. This illustrates what is for me the most important lesson in beekeeping: All beekeeping is local beekeeping. 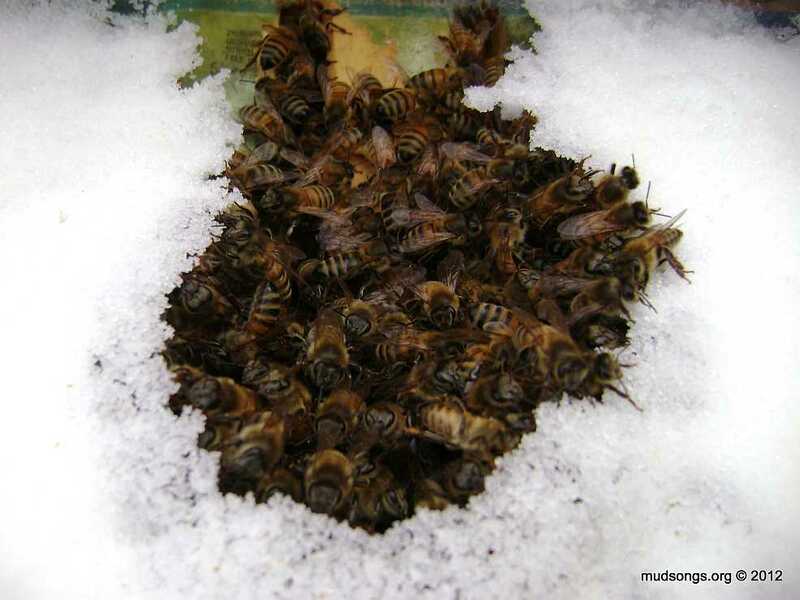 The dry sugar method of winter feeding doesn’t work for everyone because not everyone keeps their bees in exactly the same climate (i.e., a damp climate). Moreover, not everyone has exactly the same kind of hive set up (some hives hold moisture better than others) and not everyone has the same number bees inside their hive (more bees usually produce more moisture), and so on. I don’t usually mist down the sugar when I add dry sugar because I live in Newfoundland, one of the wettest and windiest places in Canada. Rain moving parallel to the ground, which is not unheard of around here, typically has no problem getting into my hives. A lack of moisture is usually not a problem where I live. But even in Newfoundland I’ve noticed a difference in the dryness of my hives in the winter since I moved my hives last year. I used to keep my bees in a place called Logy Bay, a low-lying foggy area where my bees would have been drenched if it wasn’t for moisture quilts. Sugar I added to those hives used to harden on its own within a day. On the other hand, the new location of my hives is at a fairly high elevation where fog and the dampness found in low-lying areas isn’t a factor. 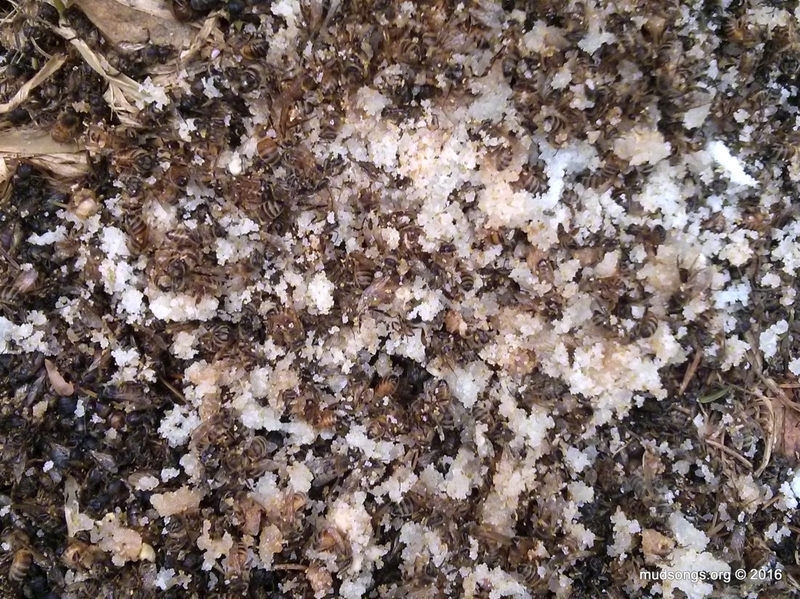 The insides of my hives are so dry now, some of the sugar I added this winter didn’t harden and was cleared out by the bees. I still plan to follow the dry sugar method next winter, but I might spray some water on the sugar to make sure it hardens (any added moisture is easily wicked away by my moisture quilts). Or I might just switch to using sugar bricks all the time. P.S. : This post revisits some speculations I made in my last post on sugar bricks. Further reading and the video from Michael Bush confirmed what I was speculating about, namely that dry sugar, or any kind of sugar added to the hive in the winter, needs to be in some sort of solid or hardened form to work. Usually. NOVEMBER 06, 2016: I’ve switched over to sugar bricks (for now). This entry was posted in Anise, Dry Sugar, Feeding, Moisture Quilts, Month of March, Spray Mist, Sugar Cakes & Bricks and tagged Practical Tips. Bookmark the permalink. I feel like hard sugar… would be harder on the bees. Won’t it be more effort for them to eat compared with fondant? Is the main advantage of dry sugar that it’s cheaper? I’ve never bothered to learn much about fondant because I know it’s too much trouble to make it myself and I can’t buy it anywhere. My only options other than fondant, that I’m aware of, are hard candy and dry sugar. I made hard candy once, hated it and will never do it again, so I’m left working with dry sugar. However, having done more homework on fondant since yesterday, I’m pretty sure I’d use it if I could for the simple reason that it contains simple sugars (glucose and fructose, just like honey) that are easier than sucrose (dry sugar) for the bees to digest. So yup, fondant seems to be the best choice. Good post. I like that tip about adding some anise oil. That stuff works like a charm in attracting the girls. Yesterday, I noticed some bees looking for water, so I filled up the bee waterers and added a couple drops of anise oil. Within a very short time, the bees had found the water and passing the news on. I’ve used anise on water dishes as well. A few drops of anise attracts a few bees who then pass the info on to the rest of the forages and then boom, the dish is full of bees lapping up the water.